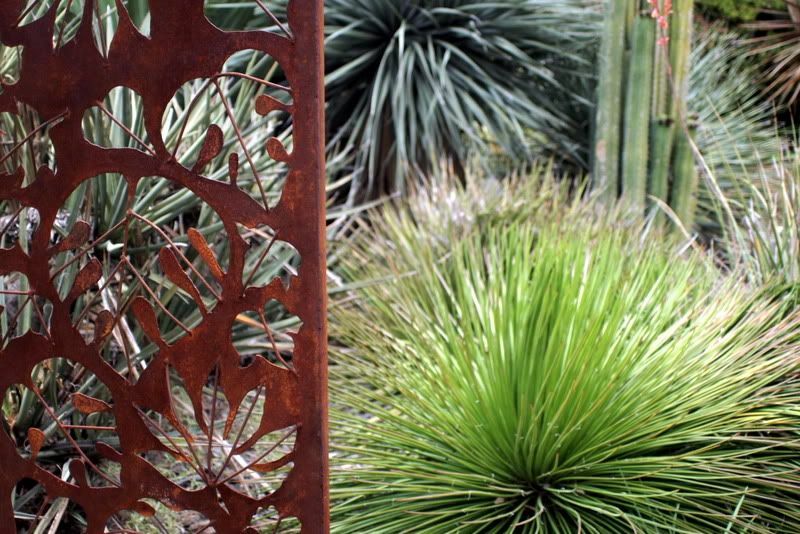 If you have an Internet connection and a love of plants, you probably also have many unmet friends with those same two attributes. Finally meeting up with them is thrilling. 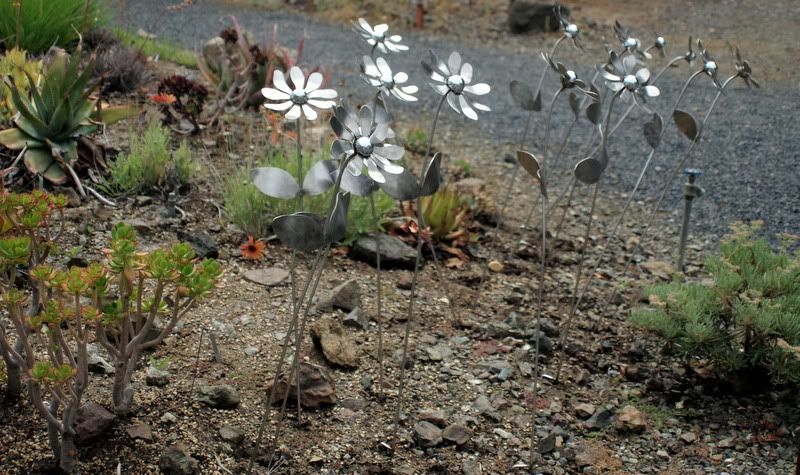 When they arrange to take you to marvelous gardens you’ve never visited before, life doesn’t get any better. 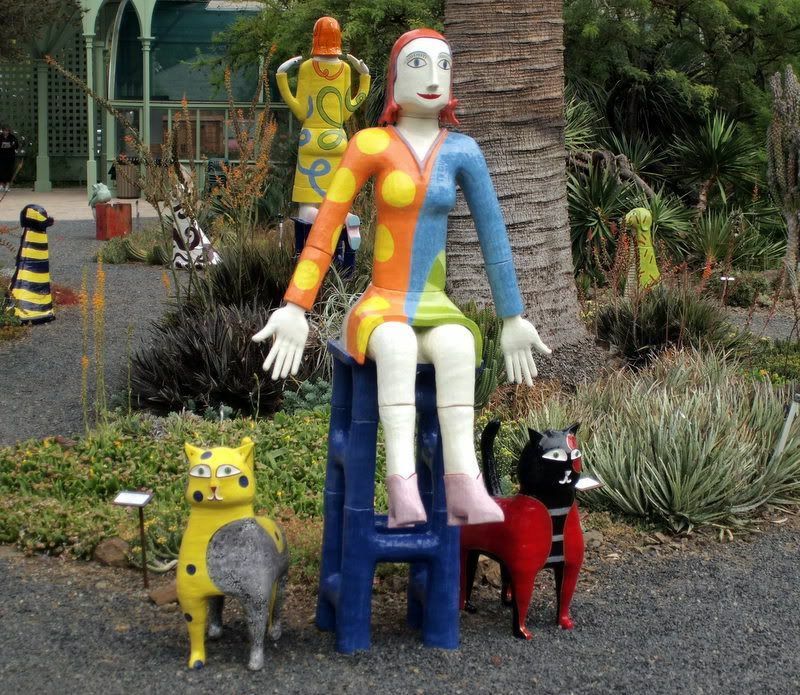 Just such a friend arranged for a group of gardeners to visit the Ruth Bancroft Garden, located in Walnut Creek, California, one I’ve long wanted to explore. The garden didn’t disappoint. This guy in the center looks a lot like my Mr. Ripple, which is an A. salmiana hybrid. Thrilling enough, no? But what I didn’t expect to find was garden scenes like this. 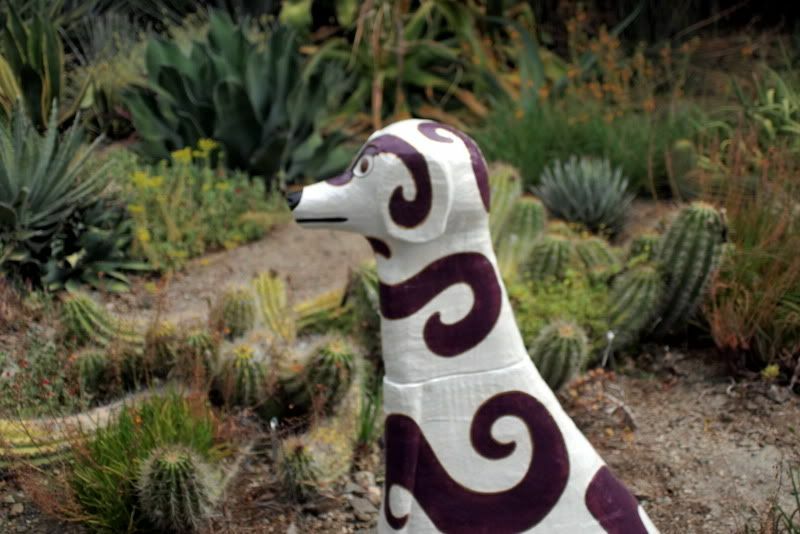 Our visit luckily coincided with the RBG’s 16th annual Sculpture in the Garden fundraiser. 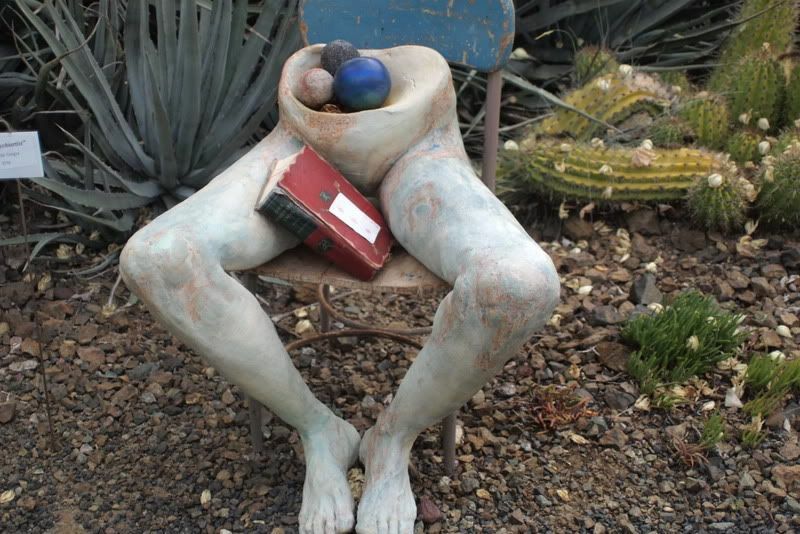 Nothing loosens up a group of gardeners more than provocative garden sculpture. You should have seen the caboose on this lizard lady. I don’t know how she kept her balance in those heels. 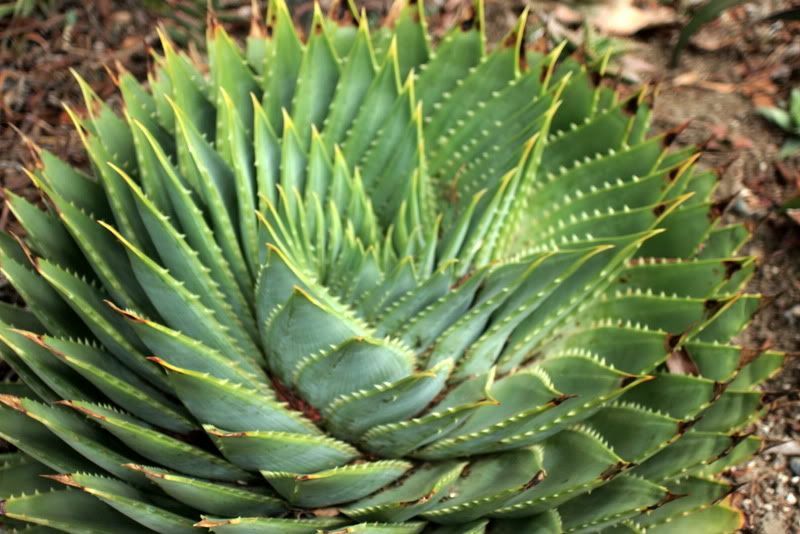 But it would take a lot more than a lizard in heels to upstage plants like the spiral aloe, Aloe polyphylla. 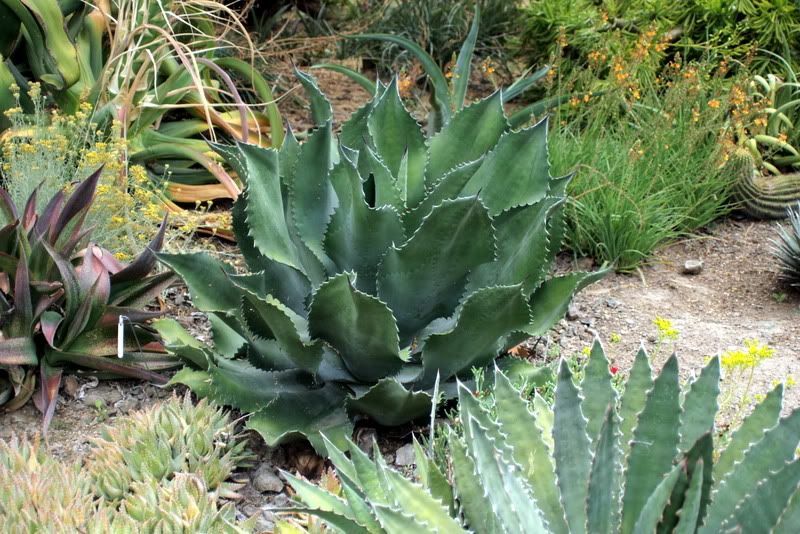 There were swathes of succulents of every stripe, spike, and rosette, including this Aloe distans. 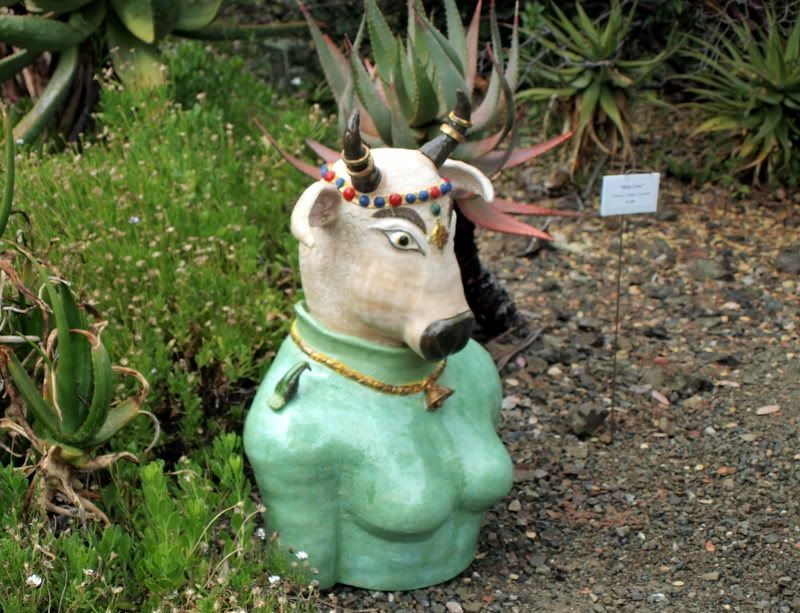 And the occasional bull-human ceramic hybrid. These sauteed gentlemen utterly charmed me. 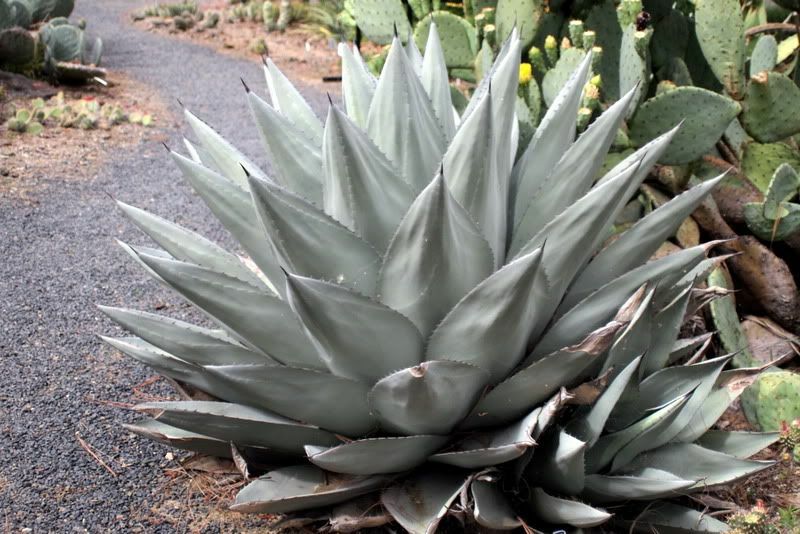 We were wondering if this regal fellow is the Sharkskin Agave, aka the Ruth Bancroft Agave. Can you tell we toured without a docent? I doubt a docent could have corralled us. We peeled off in twelve different directions, crossing paths periodically to compare notes and point out possible missed gems. 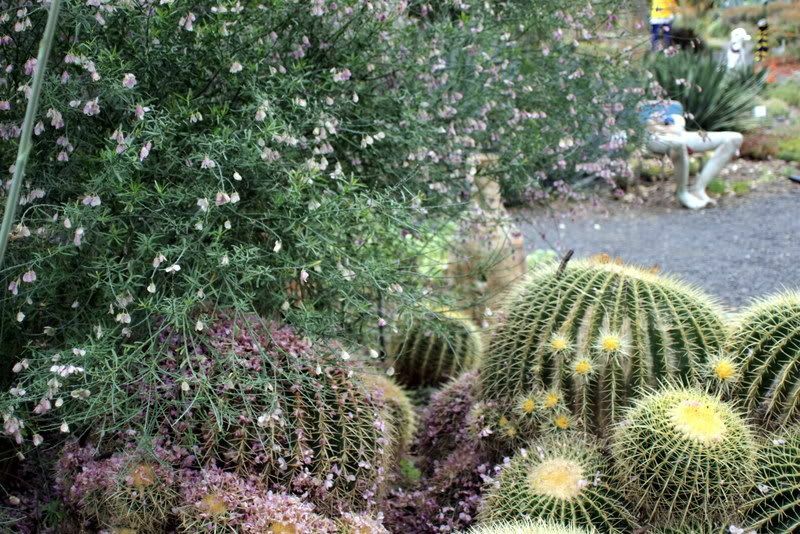 Barrel cactus and a gorgeous, diaphanous, broom-like shrub but apparently not a cytisus. No one knew its name. This plant seemed to attract the most attention. 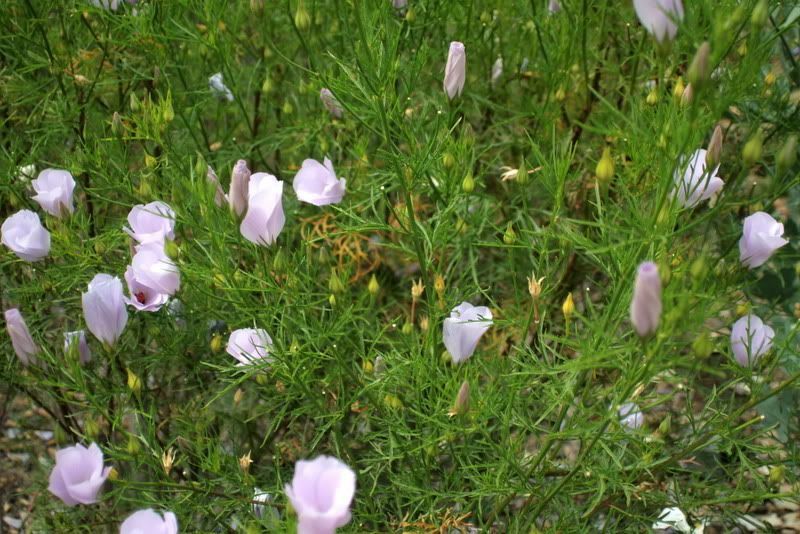 The flowers were similar in shape to our native calochortus and also to an Australian shrub that’s grown in So. Calif. that we call the “Blue Hibiscus,’ Alyogyne huegelii. The Blue Hibiscus has sandpapery-textured, maple-shaped leaves, and this shrub’s leaves were threadlike. Input from a couple docents pieced together an ID. Alyogyne hakaeifolia. 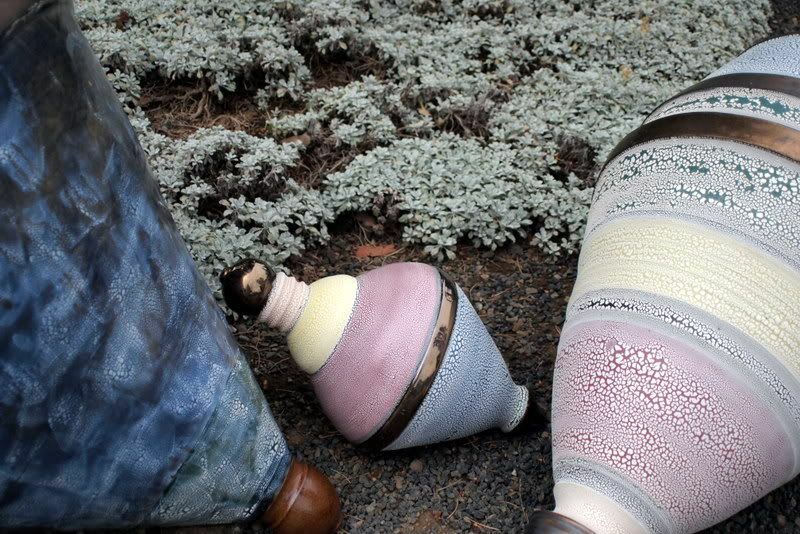 These ceramic sculptures were built in components and slipped over pvc pipe. The combinations arising from this simple technique are seemingly endless. Meeting a group of gardeners, of course, never disappoints. 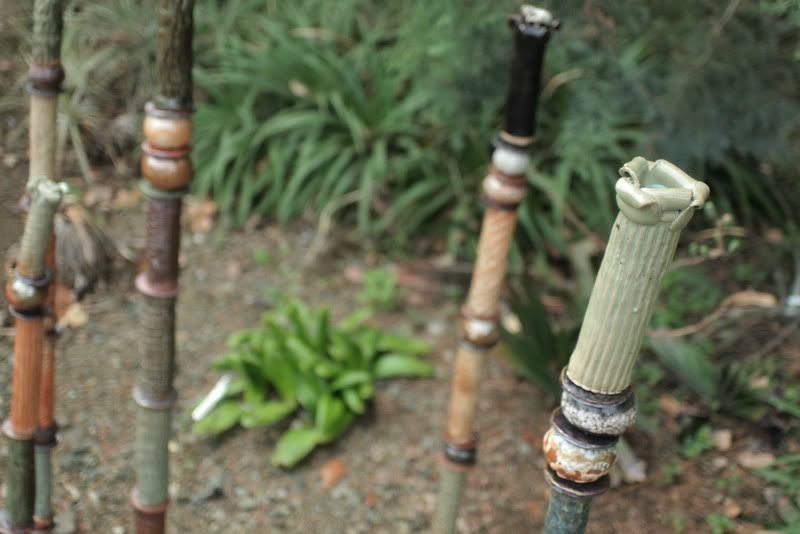 Their erudition in matters horticultural and otherwise can be astounding. 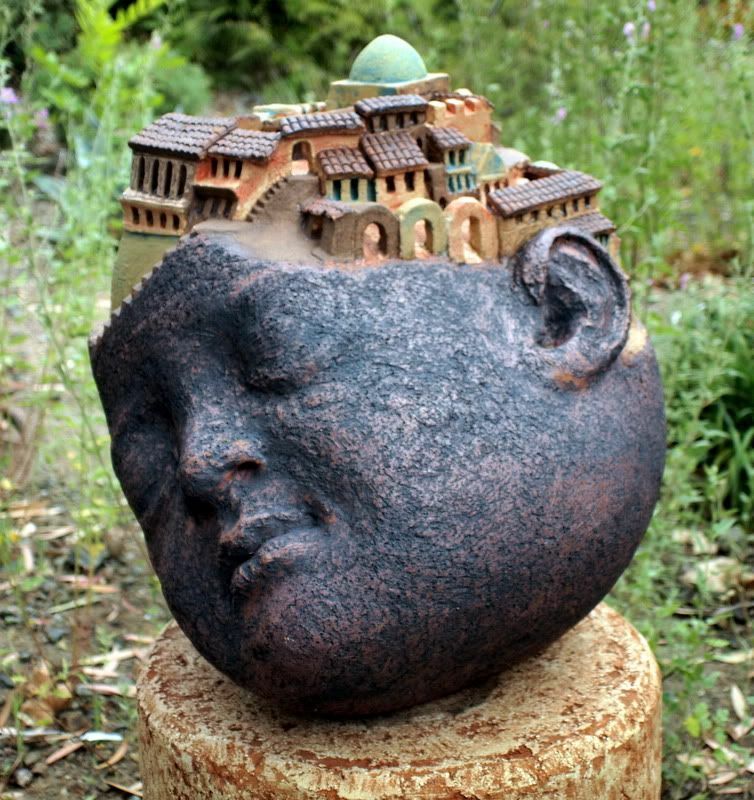 And whether fluent in botanical Latin or not, we all speak the same language and come from the same tribe. 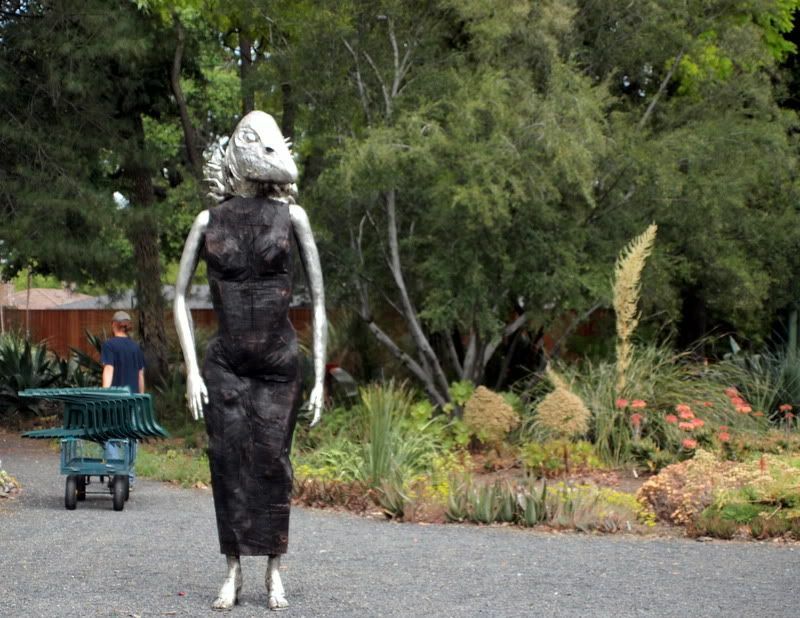 The sculpture exhibit and sale runs through July 18, 2010. 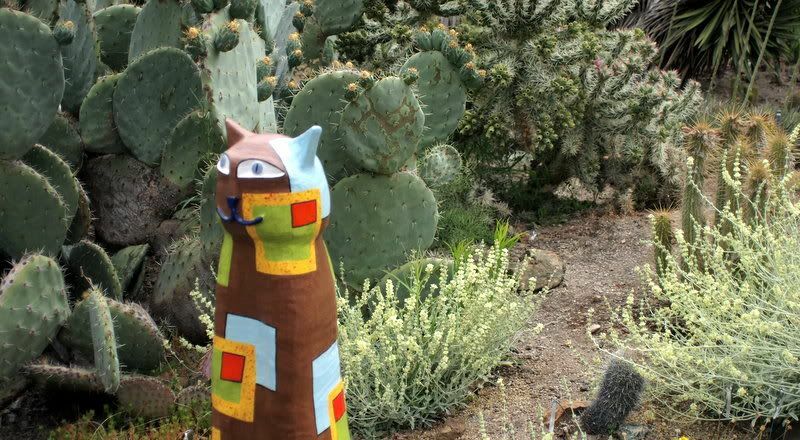 This entry was posted in agaves, woody lilies, books, garden visit, succulents and tagged The Bold Dry Garden, The Ruth Bancroft Garden. Bookmark the permalink. 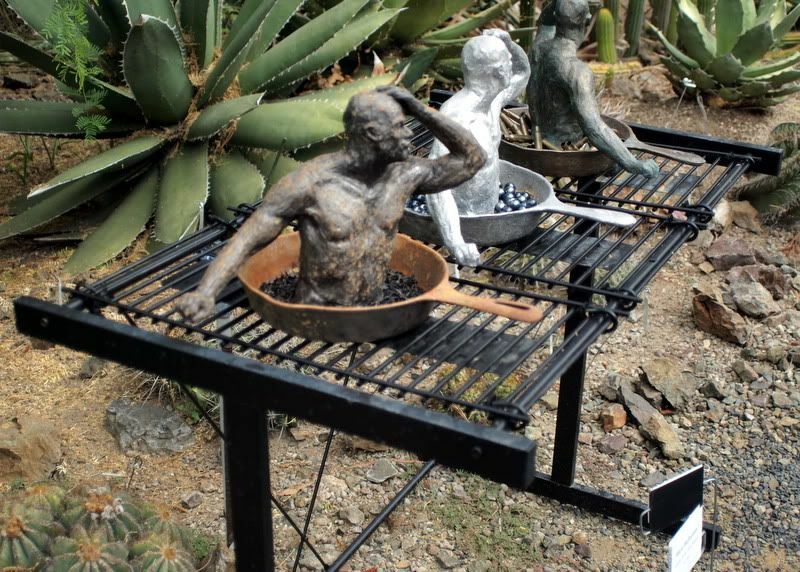 That Sharkskin Agave bested any of the sculpture in my book but I did enjoy the 3 men in the skillets. I love these photos! It’s so much fun comparing the plants between then and now. Mr Ripple is 10 times that size now! 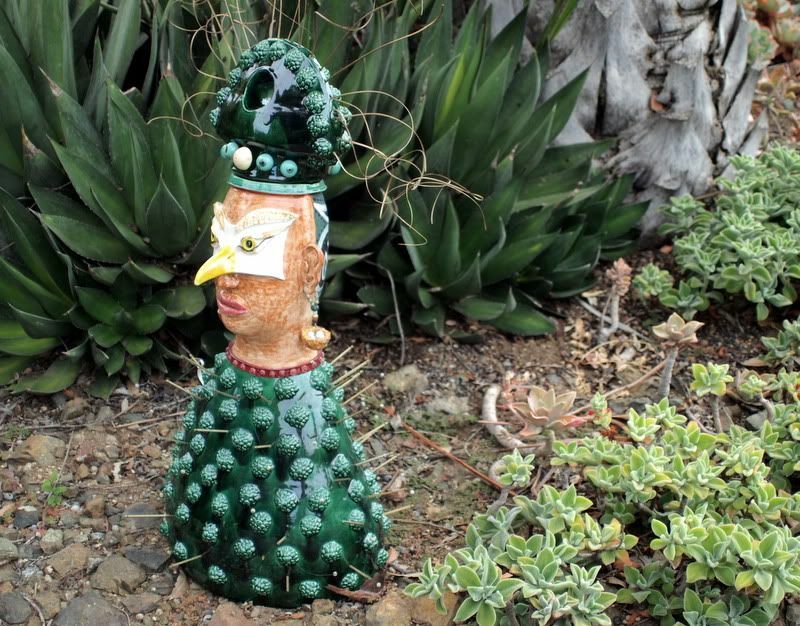 That Sharkskin Agave was my fave in the garden, and I say was because in 2011 it bloomed (I took a farewell photo) and is sadly no more. I think this was the only day I have ever visited the garden when it wasn’t full sun-I was so happy to see a bit of June Gloom that morning ! Such a great bunch of photos. 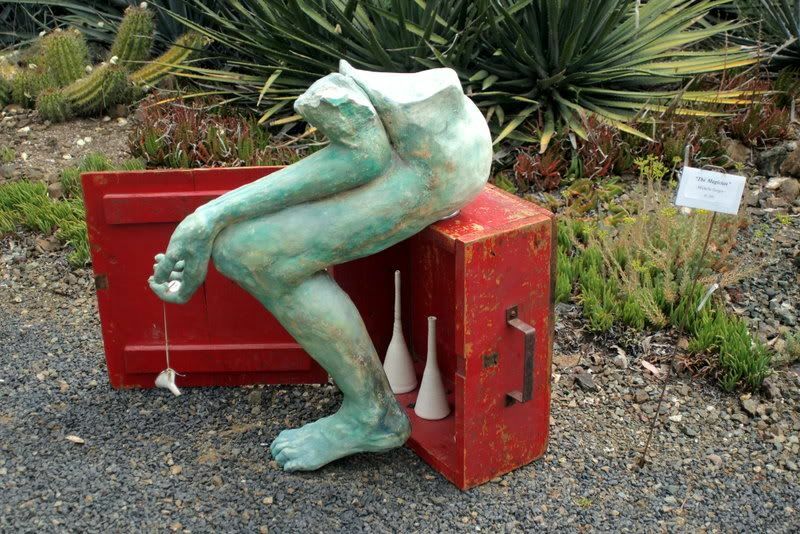 Love it and what a fun time to visit with the sculpture show. 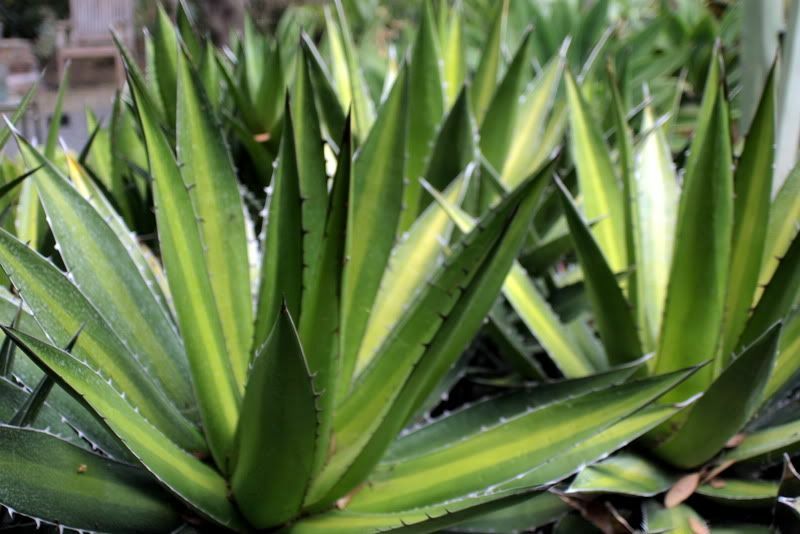 I am definitely no expert, but just to throw into the mix, the ridges on the Agave that is perhaps “Sharkskin’ make it look like A. ovatifolia to me. 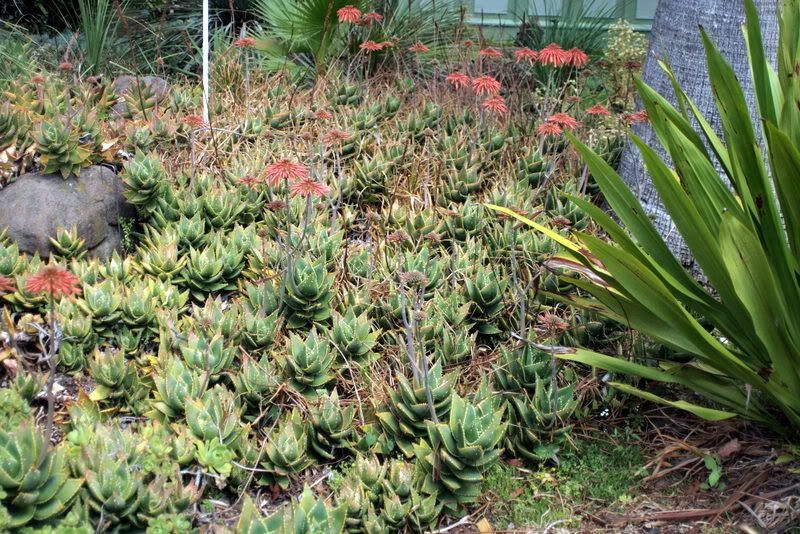 A. ovatifolia is very variable; I just revisited Gerhard’s post on his visit to Greg Starr’s garden and they were such different colors and variable (but similar) leaf shape. Then again, I could be completely misguided…. yes I’m with Tim, looks like ‘Vanzie’. Thanks for the comments and help with ID on that agave. I think the consensus is an ovatifolia, maybe ‘Vanzie,’ per Gail & Tim. I’ll have to remember to ask Brian a the RBG next visit.